As much as I tried, I had a hard time watching this back with an unbiased eye. I am still very proud of this team for their accomplishments and proud to be part of BC. All that said, this performance wasn’t as perfect as it felt Saturday night. There were some issues and they will need to be addressed next week. His stats weren’t great and he didn’t provide highlight reel material, but Davis played well. He was more decisive and his passes were much tighter and more on target than last week. His still missed two critical passes that could have been for big plays but overall only had five really bad passes. I also felt he was too quick to give the ball to Harris on the zone option read. The play becomes much less effective if he refuses to keep it. He was at his best when moving the pocket. He also showed the ability to take a snap from under center and take a clean drop (something that has been missing with Crane). At the end of the day, he did what was asked, took advantage of a few big plays and avoided mistakes. That was arguably the second best QB performance of the season (after Crane’s NC State game). Haden was effective early and is looking much more comfortable in the offense. His acceleration and ability to read a hole is much improved. Harris is tough to bring down and repeatedly made something out of nothing or turned a two yard carry into a six yard carry. The best part is we have a back who can ice the game for us. My one complaint with Harris was his blitz pick up. He left Davis exposed a few times. The WRs were limited in their involvement. Solid game from Jarvis with a very nice grab on the TD. Gunnell played well. Robinson could have had two more catches but played well. Good blocking from this group too. Purvis was only thrown to once but was very good in his blocking. McMichael saw a pass come his way for the first time and certainly made the most of it. When people look back on this season they will say that BC overachieved because of the defense. That will only tell part of the story. The reason we’ve had success with raw QBs and true freshmen running backs has been the offensive line. They once again dominated Saturday night. Can you think of one time when Davis didn’t have at least a few seconds? Turner got planted on the turf a few different times. Did it ever happen to our QB? Have there even been any major breakdowns since UNC? The offensive line was nearly perfect Saturday night. The left side of Castonzo and Ramsey were flawless (although Ramsey did get flagged once). Tennant was very good and had clean snaps. The rightside played well too. Logan designed and called a great game. He established Davis as a credible passing threat early. He struck for big plays when they were there. He grounded the ball when the situation and the line play merited it. But the real credit he deserves is as QB tutor. Davis didn’t dominate but he was ready and looked comfortable. That is because his QB coach and offensive coordinator had him ready. One of the reasons I started doing this feature was to give some recognition to unsung folks who had strong games. With Raji and Brace earning most of the spotlight (and snaps) this year, there hasn’t been much notice of Scafe. He had another strong night Saturday. Willette played well too in his first extended time in weeks. Newman (who also played on offense) got first line snaps with Ramella, Brace and Raji. He played well. Ramella had a decent game and did well in pass coverage, however, he did have a stupid penalty. Giles was limted. Raji had a monster game in both run stuffing and pass rushing. Brace looked good prior to going down with his injury. Ramsey was good in limited action. Not much needs to be said about the linebackers. All three were very good. If I am going to get nitpicky, there were a few contain breakdowns and a few missed tackles, but all three had game-changing moments. The secondary got picked on but they didn’t play as bad as it appeared. Honestly, in many cases they are just doing what they were told. The design of the D allows for a cushion. This is effective when we are getting pressure or facing an errant QB. But I’ll get to the scheme in a minute. As for actual performance, Fletcher had the roughest night of his young career. His man burned us at various times. However, one of the big completions that set up their first score was actually Bowman’s responsibility. Bowman was out of place a few times, but had some nice tackles. Davis was very good. Anderson was less active for the second week in a row. Akins had a few tackling issues. Gause also played way off his assignments but recovered well. Rollins wasn’t as active as last week. Let me first state that Spaz has done a great job this year and Saturday night the game turned on his defensive stars. That said for the second straight year Maryland accumulated a lot of yardage on us. The most frustrating part of the game was that our blitzes were working. We were flustering Turner or actually sacking him. When we gave him even a little time, he was very accurate and moved the ball. Yet we backed off?! I know in part because we were protecting the lead but it is also in Spaz’s nature as a play caller. Play calling is a bit like rock paper scissors. Sometimes I wish Spaz would just keep throwing rock if it is working instead of backing off because he is trying to keep the other guy off balance. I think this especially holds true if the QB on the other side has proven to be accurate when given time. This is why I find our special teams play so confounding. Punt block has been excellent this year. Our fake punts worked to perfection. Saturday night we ran a beautiful fake field goal. All of those types of plays call for special practice, good coaching and good execution. Yet our kickoff coverage remains poor (and that is being generous). It gave Maryland good field position again on Saturday. Gunnell made good decisions on the punt return. Kick returns were okay. Harris had decent vision. This is where the objectivity of this grading system goes out the window. Despite none of the units having their best performance, this team and staff deserve an A. The did the little things and the big things to win this game. This was a heck of a three game run. Now let’s finish the job next week in Tampa. Would you believe that we would win the Atlantic and now be one game away from winning the ACC? Hell of a job by Jags. Wow. Great team effort. Davis and the offense stepped up. The special teams converted a fake FG and the D made another huge, huge play. Hats off to Jags and the staff for pulling off the most unlikely back-to-back division titles in the division play era. Now it's Hokie time. I'll be harping on this all week, but please BC fans, show up in force next week. You won't regret it. Second viewing thoughts and grades will be up late Sunday. Consider this the semi-final round of the unofficial ACC tournament. Win and it is on to Tampa. Davis makes his true debut today and hopefully the BC D caps off a dominant season with one more great performance. -- Second-half rebounding. This team is not talented enough to win games without controlling the boards. The first half was awful as UAB grabbed 8 more rebounds than BC did. Fortunately things improved in the second half mostly due to Southern and Trapani. -- Rice getting hot. His outburst doesn't mean his slump is over. Team's are going to focus on him but he took over in the second half. -- Reggie Jackson during crunch time. He fought for rebounds and buried a critical 3. -- Sanders' scoring. He is still reckless at times, but he gave us some points when we were desperate and his pass to Raji in the zone was perfect. -- Defensive rotation. The defensive stats don't tell the whole story. UAB missed plenty of open shots. Good shooting teams will kill us if we are so lackadaisical defensively. -- Our lack of adjustments to Rice coming off the double screens at the top of the key. Clearly teams are going to shoot the big man out and double him. We need something effective out of that set to burn teams who leave one of the screeners open. This wasn't a banner week for BC basketball. If anything they offset the questionable loss to St. Louis with a nice resume win over UAB. (If Purdue stays in the top 20, that loss won't look as bad.) Now we need to build on the second halfs from MSG, get Rice hot and tear through the non-conference schedule. Tired of turkey? Get out and get some good bar food at your local game watch. If I've missed your local game watch, be sure to post it in the comments section. Thanks to Joe I for these pictures from the Garden. The Globe takes a look at Dominique Davis. The current seniors remember the Syracuse game well. I’ve already rehashed the Syracuse game. Not much needs to be said: it is a different time, different place, different stakes, different team and a different coach. What happens this Saturday will not be because of any jinx or curse. We don’t have Chris Crane, but I think we are all forgetting how much this team accomplished when Crane was giving games away. If Davis can be a “game manager” BC can win. "Maryland is playing spoiler to BC. They can keep the Eagles from heading to Tampa." I think Maryland is past the point of being spoiler. Spoiler means something when you are a losing team or are facing a No.1 type program. While we’ve accomplished more of late, we are still Maryland’s peer. They want to win so they can get to a better bowl and end the season on a high note. I don’t think they are trying to “ruin” our season or help out the Florida State team that crushed them last week. 1. Get to Turner. Florida State had Turner on his back the whole night and the Terps sputtered. Last year as Maryland gashed us, Turner had all the time in the world. We need pressure him early and often. 2. Establish the run. The whole stadium is going to expect us to run. Maryland might as well put 11 in the box. Regardless, we need to move the ball on the ground and take the pressure off of Davis. 3. No special teams’ breakdowns. The blocked punt almost cost us the Wake game. This will probably be a low scoring contest. Any points we hand them could be the difference. -- BC hasn’t lost three home games in one season since 2003. -- Since the ACC expanded Maryland is 7-12 in ACC road games. -- Maryland has never beaten six ranked teams in one season. 429 miles separates Chestnut Hill and College Park, Maryland. It is 488 miles from Coral Gables to Tallahassee. Yet no one ever says Miami is out of place in their new conference. Why do we still have to listen to the BC travel costs argument from outsiders? We don't want to get ahead of ourselves, but pay attention to the Virginia-Virginia Tech game. If the Hokies win, they advance to Tampa. If Virginia wins, Georgia Tech wins the Coastal division. Davis succeed. Given how this team has held together all year, I would hate to see the kid meltdown and cost the guys the shot at the conference game. Maryland runs the ball well. If the Terps can run, that will eat clock, limit possessions, and keep the score low. It will also reduce the chance for turnovers. Whoever controls the ball and tempo Saturday wins. I should be fretting about this game. Worried that we might blow it. Worried that Davis will be terrible. Yet I am optimistic. I think Davis will be okay and the defense will carry the day again. Darrius Heyward-Bey, Maryland's best playmaker, is questionable for Saturday. The defense is ready to pick up the slack Saturday. Billy Flutie is excited to be on the QB depth chart again. Everyone's got a piece of advice for Dominique Davis. BC harped on the defense, but I think our lack of consistent scoring was the issues against Purdue. Friday the basketball team will play UAB in the third place game of the NIT. The Michigan media thinks highly of Josh Southern. BC has offered a scholarship to Florida running back Eddie Rocker. For those who didn't see the game, it was another uneven effort that had you doubting the team's potential, then thinking things might go our way, only then to see it slip away. Regardless of the emotions, it is still a loss and not a good one. Rice is now in a true slump and if we can't figure out what to do when he is cold, we're done. -- The half court defense. It was surprisingly effective. The rotations were solid. There were still some breakdowns, but that was mostly on clearouts when our defenders were in one on ones. -- The spark from the freshmen. Jackson and Ravenel both looked good in their limited minutes. While they didn't fill the stat sheet, neither looked overwhelmed and both fought hard. -- The late run. It wasn't enough, but the guys did pull it together to cut the lead to 6 with a minute and change left. They couldn't capitalize, but it showed effort, the ability to score quickly and get some defensive stops. -- Turnovers. Sloppy effort from everyone. We cannot waste so many possessions. -- Rice's offense. Purdue swarmed him and he was unable to get the offense set nor get his teammates open looks. Lavin brought up a good point: perhaps Rice should move to the 2 spot and Paris should run the point to free things up for Rice. -- Lack of flow within the flex. It is frustrating watching a "system" offense not run that offense when things are breaking down. We need to get into the sets early and wait for the right shots. Skinner teams are at their best when they stop a run with an easy basket out of our base offense. -- Transition D. If the halfcourt was decent, this was terrible. These team has enough speed, they just need to play smarter. It is very early but I am not feeling great about this season. We need to find some answers quickly. To end on a high note, check out BC Guy Kevin Armstrong's piece on Rice. Esquire from Turtle Waxing is back to explain what's going on with his Terps. They've been wildly inconsistent and you never know what sort of effort they will put out week to week. To get a better idea of what to expect this Saturday, I asked him a few questions. His answers below. 1. The offensive line had major issues against Florida State. What happened? How do you think they will adjust against BC? Turtle Waxing: The O-line has struggled all season. They are probably a better run blocking group than pass blocking group but they have had some terrible struggles running the ball as well. It is a mediocre bunch that is pretty short on athleticism and FSU's pass rushers just abused them. The play calling certainly didn't help them as there was little done to change the protection scheme that had clearly failed. The coaches even tried to shuffle the lineup in mid-game but that had little effect. I'm guessing (hoping) that the staff adds more protection schemes to keep QB Chris Turner on his feet. The backs are not great at pass blocking but they do have two tight ends that could be on the field together. 2. The Maryland defense has been inconsistent. How have teams that beat you attacked your D? TW: Teams have beat this defense both passing and running the ball. The line is undersized and a collection of "effort" instead of talent guys. The scheme is along the lines of a bend but don't break style so they will try to limit big plays but the 8-10 yard gains are mostly there for the taking. If an offense is patient they can march down the field, it is only when you get greedy that this group can force you into mistakes. The linebackers are vulnerable in pass coverage and there are gaps between the LB and safeties when they go zone. The corners often play seven or eight yards off the line so quick hitters can get you yardage. 3. How much do you buy into the "Maryland plays better against ranked teams" theme the media falls back on? TW: I don't put much of any stock in that. Not a single "ranked" team that Maryland defeated (Cal, Wake Forest, Clemson, North Carolina) is currently in the polls so what does that little factoid really mean? There may be something to the psychology of this group getting up for ranked opponents but I don't think that will make a significant difference against Boston College. Their road record this year is pretty abysmal as they have lost their last two road games by a combined 54-13. 4. What is your prediction for Saturday? TW: Given the poor road performance of this Maryland squad I give them very little chance for an upset. There is little comparison between the Eagles defense and Maryland's. Boston College causes turnovers and the way they dominated the Seminoles on the road was very impressive to me. The staff has probably been harping on the turnovers in the FSU game all week and I think that while the Terps might not turn the ball over four times the offense will likely continue to sputter. I think BC wins with 24-13 score that isn't as close as that score would seem. Maybe a late garbage time touchdown by the offense. Another thing to keep in mind if the game is tight is that Maryland's kicker Obi Egekeze has been very unreliable. FOR MORE ON MARYLAND CHECK OUT TURTLE WAXING. The good news this week is that the BC-Maryland game will get full coverage nationally split over two networks. Most of us will have to watch on ESPN 2. If you are in BC or Maryland's core markets, the game will be on ABC. See the maps below. Pam Ward and Ray Bentley will call the game. BC offered Wisconsin product Justin Juckem. HD picked us to beat the Terps. She was right last week. Will she be right again? Maryland is still wondering what happened last week. After a bit of a drought in recruiting, BC picked up the commitment of New York lineman Oday Aboushi. The Globe restates what I said yesterday: it is Orange, Music City or San Fran for BC. Backups abound in New England. Herzy and Davis received ACC honors for the Wake Forest game. BC remains involved with Florida DE Victor Gray. Jacksonville is looking for a bailout after last year's sparsely attended ACC Championship Game. Monday means new bowl projections. The experts have us going to the Orange or the Peach. Orange can happen as it is in our hands. The Peach/ChickFilA will not happen. I am not trying to be a wet blanket. There is no one who would be more excited to see BC play in Atlanta. I just know it won't happen. They will take other teams before us and even with a win this Saturday, enough other ACC teams will be close enough in record that they can freely bypass us. Sorry folks. It's Orange or bust. HD has us as the second best team in the ACC. I moved Florida to the No. 2 spot now that the Big XII teams have all picked each other off. I favored ACC teams in later part of the ballot because I honestly believe it is the best conference from top to bottom. While lacking heavyweights, the conference doesn't have one easy W.
Dropped Out: Michigan State (#11), Brigham Young (#13), Miami (Florida) (#19), Maryland (#20), Central Michigan (#24), North Carolina (#25). I think it was about five seconds after the game ended Saturday when BC fans started thinking about the eerie parallels to 2004. For those who have blocked it out of their memories, let’s recap. -- BC wins on the road at Temple the week before Thanksgiving. Although the team won, they lost their starting QB with a broken hand. -- They face Syracuse the following week at home with a redshirt freshman QB making his first start. Win and onto a guaranteed BCS game. As we know, BC squandered the opportunity. Syracuse dominated the game from the start and BC was left wondering what happened. Now just because hopes were dashed in 2004 doesn’t mean anything this time around. In fact, I’d like to point out a few critical differences between this game and that one. -- This is not the final hurdle. Even if we beat Maryland, there is still the ACC championship game the following week. This team has a lot of work to do and probably won’t fall into the trap of looking ahead to the bowl game like the 2004 guys did. -- This team has been in more of these pressure situations than their peers on the 2004 team. 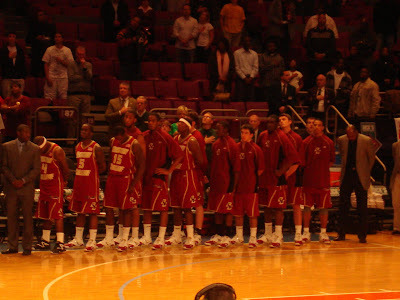 We were a clear middle-class program in 2004 and none of the guys had ever been in a BC game with real stakes. In fact they performed best when they had nothing to lose (Notre Dame, West Virginia). When the pressure was on, things were different. This group of guys has been in these types of games for five years. They haven’t won them all, but they certainly understand the pressure and focus involved in this game. -- The defense is much better. 2004 had some standouts, but as a group this defense is much better than the group we fielded in 2004. -- We have a different head coach and offensive coordinator. I always felt the guy most guilty of looking ahead in 2004 was TOB. The team came out flat and unprepared. I don’t think that will happen this week. There are a million scenarios in play Saturday. Don’t let 2004 loom too large. If anything it should help keep everyone that much more focuses on the task at hand. I am still on a high, but the second viewing dampened things a bit. Davis was as raw as he appeared live. The special teams didn’t hold up as well in the second go around either. I feel for Crane. Regardless of how he played, he waited patiently for four years and just when it was all lining up for him, he breaks his collarbone. I think he’ll get a shot as a practice squad guy or in the CFL. Hopefully he recovers fully and gets to do what he wants. As for the actually game, Crane’s start was so-so. The fumble was another case of not protecting the ball. He also had a bad throw where he missed Robinson for a TD. Davis…where do you start? Considering the circumstances and the outcome, we can’t really complain. His primary problem was his hesitation. He hesitated on his reads. He hesitated in the pocket on whether to run or stay. He hesitated on the option reads. He admitted to jitters and nerves. The speed would get to most redshirt freshmen QBs. Fortunately he recovered to lead us to the win. By my count he had six really bad throws and the WRs only had one true drop. The good news: his short outs and passes to the flats were solid. He can throw the fade. His throws over the middle and in traffic weren’t as pretty. He was lucky that two other passes weren’t picks. The good news was he did just enough and now he has a week to get mentally and physically ready for Maryland. The running backs played well. Haden received more of the carries and did his best job yet of finding the holes in the zone. Haden also had the biggest mistake of the two. He missed the blitz pick up on Davis’ second fumble (in fairness to him, it was a delayed blitz). Harris was contained a bit in part because most of his carries came when Wake was keying on the run. Harris was a more important part of the passing game. I imagine that both will get plenty of throws this week as we try to make things easier for Davis. The offensive line had another strong game. Tennant got the yips a little early with the snaps, but calmed down as the game wore on and played very, very well. His block on the screen pass might have been the best block of the day. Ramsey was very good and there were plenty of holes around his area. Castonzo was very good. Claiborne had one of his best games. Lapham allowed a sack but other than that played well. Purvis only caught one ball, but was very good blocking. Gunnell saved the day with the long catch, but he was also very good on the comeback routes. Robinson was very good. Jarvis had a rare drop. Anderson blocked well. The play calling was appropriate. With Crane we picked up where we left off and it looked a lot like the FSU game (fumble included). Once Davis saw the field the tone and approach changed. It also got conservative. However, Logan seemed to find things that played to Davis’ strength (the classic option looked good). The passes to the flats were good. And he found the right type of plays on the final drive. The defensive line played well early. Raji and Brace were their usually menacing selves. Giles and Ramella both had their best games of the season. They did a good job at containing and collapsing the pocket. The two Ends also helped disrupt Wake’s attempts to run the ball on the edges. A little disconcerting was Raji and Brace’s efforts in the fourth quarter. They seemed worn and were finally getting blown off the ball. Perhaps they were gassed, which is not surprising since the second teamers barely got on the field. When they did, they blew up a reverse (Scafe and Ramsey in particular). Herzy got the accolades and made two game-changing plays, but I thought McLaughlin and Francois were also very, very good. The three of them had their best day in coverage in a month. They all tackled well. They only real nit picky moments were a missed tackle by Francois and Herzy losing contain on a big pass from Skinner. Rollins -- excellent. A corner is at his best in Spaz’s scheme when he closes quickly and wraps up. That is what Rollins did yesterday. He was good in coverage and great in tackling. Easily his best game of the season. Davis was also very good…good run support and pass. Anderson struggled a bit. On Wake’s one TD he got faked out by their play action. He also missed a tackle. Gause was very good. Fletcher nearly had another INT. Akins was quiet. Bowman was good (although he had a dumb penalty on one of the kick returns). The defensive scheme was excellent. We held them to the lowest yardage of the Grobe era. We put pressure on Skinner early and kept him off balance all day. We had a higher percentage of blitz than we’ve used all season. Obviously bringing Herzy was very effective, but McLaughlin, Rollins, Akins and Gause all came at different times. My one little gripe about the defensive plan is the shortened rotation. I understand the short rotation with the linebackers as those second team guys are not ready for prime time. I don’t understand it with the defensive line. I know there will be a drop off anytime you take Raji and Brace off the field, but keeping them fresh is important too. And the guys like Scafe and Ramsey looked good in limited playing time. They deserved more snaps. The rotation wasn’t as tight in the secondary but it didn’t seem to be as balanced as it has been. Harris looks better and better each week returning kicks. The blocking seemed improved too. Steve Aponavicius made his Field Goals. Gunnell couldn’t do much with the punt returns. Wake’s punts weren’t long but the coverage got their quick. The kickoffs were a mixed bag. Quigley was inconsistent as was the coverage. The punts were also wildly inconsistent. The Flutie directional worked. Quigley also got some good rolls. The bigger problem was the punt protection. Wake blocked one on blown assignments from Herzy and Newman. Wake nearly blocked another. With the game going the way it did, Special Teams took on extra importance. We were lucky the breakdowns didn't cost us the game. Once again the team came out with the right defensive scheme and the right emotional one. When things looked bleak, they rallied. Jags also deserves credit for keeping Davis calm on the last drive and managing the clock well. This has been a heck of a stretch...hats off to Jags for getting the team on track after Clemson and then winning three critical games. Now let's keep it going against Maryland. Lost in the euphoria of the Wake win was the basketball team's loss in St. Louis. Rice had a lousy night, Southern got in foul trouble and we were poor from the line. Yet we almost won. We will learn a lot about this team by how they bounce back against Purdue. Notre Dame killed the BC women's basketball team. The women's soccer team had an early exit from the tournament. Hockey followed a win over UMass on Friday with an OT loss on Saturday night. HD gave a shoutout to Herzy. Some of pundits are now predicting BC will end in the Orange Bowl. Well an unpredictable season just got that much more unpredictable. Tough break for Crane. Now we will see what Davis can do. Needless to say, his first performance ended on a high note. The defense saved the day though. Now we need to regroup and shift the focus to Maryland. I'll post my grades and second viewing thoughts Sunday. Consider this the second round of the unofficial ACC tournament. Winston-Salem has been a tough place for us to play. Let's hope we turn it around today. Lost in all the success of our major sports is the budding soccer power growing at the Heights. The BC women won their first two NCAA tournament games. They play Florida State in the third round this Saturday. 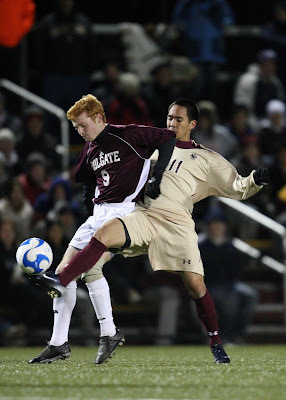 The men's team host Colgate in the first round of their tournament Friday afternoon. Most of you will be able to see this game from your couch but that doesn't mean that a game watch wouldn't be fun. Below are the known watches. As always, leave a comment or email me if your chapter is having one and it is not listed. The Globe featured B.J. Raji this morning. A Springfield station featured Ron Brace. It's interesting that in the Globe article on Raji, Spaz takes time to praise Brace for taking his game to a whole new level. Raji probably has the bigger upside but both have been very good this year. Hopefully both will make first team ACC. Former Eagle Scott Clemmensen is filling the void left by Martin Brodeur. The notes section of this article mentions the strong season future Eagle Andre Lawrence has put together. BC is adjusting to the volatile economic times. Ryan got the front page treatment on ESPN.com this afternoon. Thanks to all who sent the link along. The Chick-Fil-A bowl updated their selection blog. For those of you who cannot see through the BS, I'll give you my interpretation: "we want UNC and are dreading the mere thought of BC." Although I dread playing them every year, I am glad Wake Forest continues to have success in the ACC. They remain the counterargument to any media member, fan or supposed expert who says BC’s limitations will keep us from winning championships. Now this is college football and the limitations will keep both schools from being No. 1 year after year, but Wake Forest won the conference two years ago. When we line up this Saturday, we should look across the field and realize that we can do it this year. “Special teams will really make a difference in this game.” With their Mr. Clutch Sam Swank returning and our kicking situation kindly described as uncertain, the placekicking will probably be an added emphasis of the broadcast. I think the importance might be a bit overstated. Although Ohligher shanked three FGs in Winston-Salem in 2004, the Wake games haven’t really turned on kicking. The key to their success against us have been big plays on misdirection. Now that the more teams are playing like Wake, I think BC is better prepared than we have been in the past for the Deacons. 1. Exploit the splits. Wake’s offensive line uses fairly wide splits. This makes double teaming a big DT a little more difficult. The trade off for the offense is you assume the big DT is slow and cannot cover as much ground. That’s not the case with BC. We need Raji and Brace sprinting through those gaps and forcing the play elsewhere. 2. Pressure on Riley. It is unfortunate that we don’t have a great pass rusher. We’ll need someone to step up this weekend. When teams get to Riley their offense starts to break down. 3. Getting big plays out of play action. After last week, Wake will be keying on Crane out of the option read. It would be a nice twist to play fake out of that and get a few big passing plays. Due to the conference move and the break in the Virginia Tech series, Wake Forest is now BC’s longest active series. Saturday will be the sixth year in a row that BC has played Wake. I'll have my eye on Maryland-FSU. We control our own destiny but what happens to the Terps this Saturday will certainly influence how they enter our game next weekend. The Tight Ends get more involved in the passing game. We’ve used our bigger Tight Ends to exploit holes in Wake’s D in the past. It carries more risk since you are asking Crane to throw into traffic, but I think we can get some big plays with Anderson and Purvis. Wake gets big plays in the passing game. I am fine with letting them dink and dunk. If they go over the top on deep routes, BC might be vulnerable. I think last week gave the whole team a nice shot in the arm. The offensive line showed they can control a game and made life easier for Crane. I think BC stays conservative, wins the battle up front and stays alive with a win. The media picked up on Jags' words of encouragement to Myron Rolle (here and here). While it is a little out of place during the game, it is still a nice gesture...and because he just randomly said it during live action, you know the sentiment is genuine. Uh oh, HD picked BC this week. She been on the wrong side of most of her BC predictions. Mike Vega makes a cameo appearance on the BC beat with this article on Montel Harris. This article explains how turnovers are not the end all be all. It's all situational. Did anyone see this the other night at Conte? It seems Loyola coach Jimmy Pastos took a seat in the stands during the consolation game. Weird. Here is the coverage map for the Wake Forest game. Most of the country will get it on either ABC or via the mirror coverage on ESPN. The only areas out of luck are Chicago and the Bay Area. Fortunately we have strong game watch groups in both areas. The BC secondary gets its due. Not sports, but BC is leading the way in not giving BC students email addresses. Terry Gannon and David Norrie will call the BC game this Saturday. This FSU blog has a good drive chart breakdown from our game. BC and Stanford are both interested in 2010 recruit Troy Gloster. Here is an interesting article on jock majors at certain schools. I know we have some majors that are more popular than others with BC athletes, but our core remains demanding regardless of which school you are in or which major you choose. The BC women still play Holy Cross. They crushed the Crusaders Tuesday night. Since this game was on ESPN 2, I'm guessing this was the first chance for most of you to watch the team. In my opinion the game had a similar feel to the Loyola game: BC's offense stalled for long periods, the defense was lacking and Rice's spark in the second half helped BC pull away. Here are my quick thoughts. Share yours in the comments. -- Rice scored with ease and took over the game when he needed to in the second half. -- Dunn looked overmatched when our other bigs got in foul trouble. Thanks to Chris for capturing the mood before tip-off. For Eagle fans in the New York area, please come out and support the team at the Garden next week. HD posted a Crane article. He's saying all the right things. Let's hope he finishes his BC career on a high note. QB recruit Nico Ranieri doesn't have an offer yet but is setting up a visit to Boston. Quron Pratt will visit BC in December. The Men's Soccer game is now at 5 pm on Friday. I was able to watch the basketball team tonight courtesy of ESPN U. They beat Loyola (MD) 90-57. The game wasn't as crisp or as clean as the final score might lead you to believe. Here are my initial thoughts on the young team's second game. -- The offense looked much better than it did all of last year. Rice got in foul trouble early so they played without him for much of the first half. Without him they ran plenty of plays from the flex and generated good, balanced offense. -- Trapani looks to be a solid contributor. Raji gets "it" and knows how to make the most of his garbage points. When you think back to last season at this time and watch Southern now, it is a different person. His touch around the glass is very encouraging. -- Once Rice returned, the transition game took off. Rice also got hot with his own shot late in the game. -- Raji showed decent post moves. Jackson looked very fluid running the floor. -- Ravenal held his own in limited minutes. 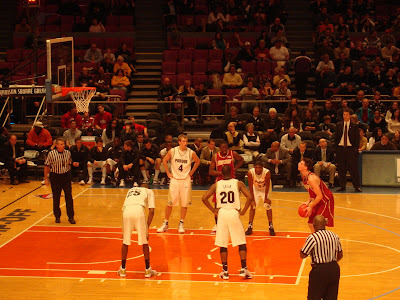 -- The flex looked good and Southern can make the pass to the baseline cutter. -- We are going to have defensive issues. The score wasn't close but Loyola moved the ball with little pressure. Their guards killed ours off the dribble. -- Sanders' traveling habit returned. This guy needs to figure out what type of player he wants to be. -- The full court trap flustered us a bit. Imagine what it will be like under a team of real athletes. -- Southern's touch is nice but he needs to attack the rim more or he'll keep getting blocked. At the end of the day this was a game at home against Loyola (MD). Tuesday we play St.Johns. After that we'll have a better idea if the team's struggles were part of a bigger problem or just rust. The ACC named Marcellus Bowman its Defensive Back of the Week. Kickoff for the Maryland game is still TBD. We know it will be noon or 3:30. We don't know what channel. All will be sorted out after the Wake game. Wake will have their ace kicker Sam Swank back this weekend. 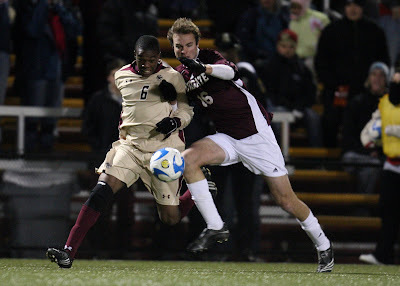 BC is hosting Colgate in the first round of the NCAA soccer tournament. Hop on a Newton Bus Friday and support the team. 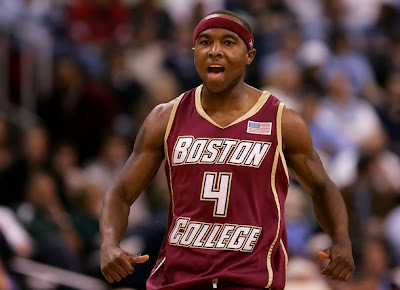 BC still wants basketball player Harold Spears to play football. A current BC student was hit by the Green Line Sunday. Sad news. I wish him the best and hope for a quick recovery. Kids, watch where you are going. Things are bottlenecked at the top of my ballot. Once these teams play each other over the next few weeks, my rankings will shake out. I feared putting BC in the top 25...as I didn't want to jinx them. I felt a little better after seeing the Interruption ballot. If BC goes down this weekend we'll share the blame. Dropped Out: Florida State (#12), Wake Forest (#22), South Carolina (#24). I've labeled Herbie a BC hater in the past but he was pretty effusive in his praise after the game. Busy weekend around the Heights. Basketball won despite Rice's suspension. Women's soccer advanced in the NCAA tournament. Hockey beat UNH Saturday night. Expect the ACC backlash to get even louder if we somehow win the whole thing. HD moved BC to 3rd in her Power Rankings. She did praise Spaz for the game. BC, Maryland and Miami are the only ACC teams that control their own destiny. Cathy Inglese is keeping mum on her departure from BC. This last clip is a bit old and the audio is only so so, but I included it because the hosts introduce Al as "Coach Handsome." I obviously enjoyed and appreciated this game the first time through. The second time gave me new respect for the coordinators. Both had great game plans and if not for a few plays here and there, BC would have blown out the Seminoles. Game manager Chris Crane was pretty good passing the ball. Only four really bad throws on his part. Sure he was a little off when trying to hit guys in stride, but overall he threw well. Even the INT was not entirely his fault (Tennant’s man batted the ball). Crane made good reads on the option runs as well. My main problem were the fumbles. Both fumbles were as much mental mistakes as they were bad luck or great plays by FSU. When running he should know to protect it with two hands. The other fumble was as the pocket was collapsing. Crane needs to be aware and be cognizant of the potential strip. When giving a final assessment though, it was his best game since NC State. Montel Harris got deserved praise throughout the broadcast. His ability to stop and start and get an extra yard or two is a deadly combo. He also showed surprising strength on the TD run. Harris wasn’t perfect though. His passive block led to Crane getting crushed on one of Crane’s fumbles. Josh Haden didn’t have as much success running the ball, but his long catch on the swing pass was a great example of what he can do in space. It’s exciting to know we get to watch them both over the next four years. Rich Gunnell had another very good game. In addition to his touchdown, he also deserves kudos for his big block on the long Haden catch. Robinson had a decent game. He made some big catches but also had a few drops. Jarvis was solid and probably has the best hands on the team. The other WRs weren’t as involved in the passing. Purvis and Anderson were used on the field together throughout the night (mostly in place of McCluskey). Anderson played well. Purvis didn’t get thrown to but he blocked well. The offensive line got better as the game wore on. Ramsey was excellent again and did a great job in both aspects of the game. I don’t think he’ll get the pub needed, but he’s really having an all conference season. Castonzo had a little problem with their speed rushers early but locked in during the second half. Tennant was very good. The one mistake was when his man tipped Crane’s pass. Claiborne had his best game of the season. Lapham struggled early and had a few mistakes but settled in and was very good in the second half. Logan called a great game. We showed them new wrinkles (the Gunnell end-arounds). We were patient with the run. We kept them off balance with the passing and when the game was on the line we ran and ran and ran. My one minor complaint was the redzone offense. It was very cautious and we left points on the board. Newman played well. Giles and Ramellas were okay. They kept contain for the most part but couldn’t close. Ramsey didn’t get as involved. Scafe was limited but played well. Rossi was also very good. Raji – awesome. Not as dominant as the Notre Dame game but still very good. He helped force their running game to the edge all night. Brace was right there with him and had a good game. Brent and Kirk gushed over Herzy. He was good but didn’t play as well as they said. He had trouble with man coverage against the smaller guys. He also had trouble closing on Ponder a few different times. Don’t get me wrong…he was a positive factor in the game, just not as good as some of his recent effort. McLaughlin had one of his better games. He was punishing guys throughout and made good tackles. Francois continues to play well in place of Toal. He was good in run stopping and is a good tackler. The DBs were excellent as a group. Bowman had the game of his life. First the INT and later a critical sack on Ponder. He also tackled well. Fletcher had the interception and an all around solid game. Davis was very, very good and active all over the field. The head-to-head call on him was BS. Gause might be our most physical corner. He hits hard and the strength he showed on his INT was impressive. What I like about all the DBs is that none of them seem to lack confidence when in single coverage. The only one who struggled a bit on Saturday was Anderson. He got tripped up on the TD pass and missed a few tackles. Akins played closer to the line in more of a LB role. He was okay. He made some plays but also had a few tackling miscues. Spaz once again used the blitz sparingly but teased it enough to have Ponder guessing. We also were prepared for nearly everything they showed. The tackling was good and we generated multiple turnovers again. The team was well prepared, adjusted and confused the opponent. No complaints from me. The kickoffs were not great. I understand what they are trying to do (keep it short and out of the playmakers’ hands). But we are not doing it well and handing the other team great filed position. The field goals were chip shots that Stevie handled well. The punting wasn’t great but the punt coverage was very good. Our own black shirts and the onsides kick are the obvious things you could point to as good moves by Jags. However, those gimmicky things overlooks the more substantial aspects of the game prep. Say what you will about FSU being overrated, they still have real talent all over the field. Yet Jags and his staff designed a plan that exploited their weaknesses. I also give Jags credit for keeping this team focused in this stretch. Things could have fallen apart at various times this year. Injuries and QB issues have undone many seasons for many teams. Yet this team rallied from its two game skid to put together two excellent games. Now let’s see how we do in the actual driver’s seat. Forget survive and advance. That was a dominating performance from start to finish. I think the score was a little misleading as BC was in control throughout. Things weren't perfect though, but all units played well as a whole. The win is nice but we still need to run the table to get to Tampa. If we play like we did tonight, it can be done. Second viewing thoughts and grades late Sunday. We are now in the unofficial ACC tournament. Win and we are still alive. Lose and it is Boise or San Francisco. Let's hope the black out is good luck for us again. Still listed under violation of team rules, but now Rice will only miss Friday's game. He will play in all the preseason NIT games. The basketball season starts tonight without Tyrese Rice. The senior guard will miss the first three games of the season for the purposely vague "violation of team rules." He'll be back for the Saint Louis game. BC should be fine without him tonight. [UPDATED] FSU announced Taiwan Easterling, Bert Reed, Corey Surrency, Cameron Wade and Richard Goodman will miss the BC game due to suspension. BC is recruiting Jonathan Davis as a running back. According to this write up BC is in the mix of DC guys Andrew Crawford and Stephon Robertson. Al Skinner is coming off his worst year since the Troy Bell turnaround. He has a solid nucleus of young returning players, some new faces and a star in Tyrese Rice. Can it all come together and get BC back in the postseason? We will soon find out. In the meantime, let's take a closer look at the guy whose upside will determine the season: Tyrese Rice. The storyline is that Rice came back because he was didn't want to leave BC a loser. The truth is probably that his build and game don't translate well to the NBA. Regardless of what his motivation is, hopefully Rice plays with a chip on his shoulder and gets this team into some postseason tournament. Rice carried this team for much of last season. This year he'll be asked to do the same but in more of a distributor role. But I still think we could see another 40-point game or two if he is really feeling it. Great shooter from anywhere. He won't be bothered by the new 3-point line. Showed he can score driving to the basket. Ice cold from the FT line. Can score on anyone in the ACC. Has the ability to take over games single-handedly. Inconsistent defender. Has yet to prove he can shutdown the top guards in the ACC. Needs to make more of an effort to get his teammates involved in the offense when he is not making his shots. Assuming he stays healthy, he should become the seventh player to score 2,000 points in his BC career. Rice is one of the best players in the ACC and can be one of the best players in the country. An improved defensive effort and getting his teammates more involved could be enough to swing BC's record over .500. If he can get BC off the bubble and into the tournament, BC could be a dangerous team just on his potential alone (see Stephen Curry's run with Davidson). I like Rice and hope he does round out his game and ends his BC career on a high note. Last week's game watch turnout was impressive. Hopefully everyone had a good time. If you are looking to watch the game with fellow BC fans, below are some locations. Email me or post in the comments for any additions. The basketball season officially starts tonight against Central Connecticut. Good seats are still available. You can watch most of the early season games via ACC Select. The Herald's preview posed five questions facing the team. The key to the season is Rice. Still no word on possible suspensions facing Florida State players. I doubt any will miss action this Saturday. Tony Barnhart predicted Florida State. The past three years have been the worst three year stretch of the Bobby Bowden era. Yet BC only went 1-2 against the Seminoles during that time. Sobering isn’t it? Florida State appears to be on another accession while BC is patching together a transition year. All that can change this Saturday. If BC can pull off the upset, we are in the driver’s seat for the division and the Seminoles are left wondering what went wrong again. “Florida State is wearing the all black in honor of the unconquered Seminole Nation.” I appreciate pageantry. I like when schools have unique mascots and embrace the iconography and history around it. But come on, this Black Out stuff is pure marketing. FSU wants to sell more t-shirts and jerseys. They want to appear cool to recruits. They want to generate a buzz. I hope the ABC guys don’t go overboard spinning the Seminole Nation BS. This isn’t about the trail of tears. It’s a football game and a lot of green will be made off of that black. 1. Keep Ponder in the pocket. Regardless of whether or not some FSU receivers are suspended because of their brawl, the key to stopping Florida State is making Ponder one-dimensional. If BC keeps him from breaking off those subtly deadly five and ten yard runs, their offense will bog down. 2. Remain patient with the ground game. Lost among all the postgame euphoria after Notre Dame was BC’s willingness to stick to the run. I think a low-scoring, ball-control game helps BC. We need to keep running the ball in the second half. 3. No missed tackles. The Clemson game turned on Spiller’s big plays. Many of those big plays could have been contained if BC guys weren’t flailing all over the place. The tackling was much better against Notre Dame. It needs to be even better Saturday night. 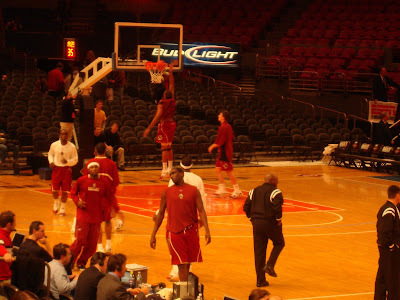 BC did not play a game in the state of Florida in 2003, 2004 or 2005. This will be our fifth game in the sunshine state since 2006. We control our destiny but pay attention to Wake-NC State. In recent games the Deacons have shown new life. How they play against TOB might be an indicator of what we’ll face next week. BC contain their kickoffs. Things got better last week with Quigley kicking. I don’t know how much of that is attributable to Notre Dame’s return men or our improved coverage. Florida State is like Clemson in their ability to make a big play on Special Teams. We need to avoid that Saturday. We can’t score in the redzone. We all know the kicking problems. We were lucky it wasn’t a factor last week. BC needs to convert opportunities. If we don’t, I’ll see you in San Francisco. I wish I felt better about this game. I don’t think FSU is great…just a bad matchup for us. But they are dependent on Ponder. Slow him, and play conservatively with runs from Harris, Haden and Crane and we can steal this game. Following our game with Clemson, many Tiger fans took the time to write and email Clarence Megwa. To thank them, Jags wrote this letter. Class acts all around. BC beat Clemson in the first round of the ACC soccer tournament. A few Florida State players were involved in a campus fight Wednesday. Wanna bet that all involved will play Saturday night? Brock Bradford hasn't lost a step since returning back to the ice. Herzy got the full beat writer treatment as he was featured in the Globe, Herald and Daily News. All three articles had a focus on his draft status. I obviously hope he stays. Of resent BC guys, staying helped Ryan and Cherilus. It probably hurt Kiwi a bit (although he was a first rounder and has a Super Bowl ring). Dan Williams will be used at fullback behind Codi Boek. HD picked Florida State. Will this be another week where her pick jinxes our opponent? The Globe featured new women's basketball coach Sylvia Crawley in an article today. 2010 BC target Peter Thomas enjoyed the Notre Dame game. BC target Davon Custis will also visit Stanford. Here is the link. Most of the country will get to see BC and Florida State. As I mentioned earlier, BC fans in the Big XII markets will have to find alternative viewing locations. BC is now in playoff mode. Win and move on. Run the table and we win the division. It all starts this Saturday against Florida State. To get a better feel for this year's 'Noles, I asked Bill from Scalpem.com a few questions. His answers are below. 1. Everyone is talking about the improvement of your offensive line. How have they dealt with big defensive tackles (like BC has)? Also, which teams have given them the most trouble? Scalpem.com: Here's the story on the offensive line, they're young, improving, but they are not good pass blockers yet. Basically, big, slower, run-stoppers shouldn't give them a problem, but a speedy pass rusher has a good shot to get to the FSU QBs. Wake Forest did it all night against the Noles early in the season. They were quick to the QB, harassed the backfield and generally disrupted anything the offense tried to do. The key for the Noles is to make sure they can run the ball, even on BC's big tackles. If Jermaine Thomas and Antone Smith establish themselves early, it takes away from what BC can do with the blitz, which gives Christian Ponder some time, and the receivers a chance to be a big part of the game. 2. Your defensive stats don't seem to tell the whole story. For example FSU's yards per game is not in line with your points per game stats. What caused the disparity? Scalpem.com: Two high school teams (FCS) count in those stats. The defense isn't quite as good as a lot of opponents think, but they probably aren't as bad as I think either. Part of the PPG issue is the Miami game, where the defense didn't give up a bunch of those points, the offense and special teams did. Either way you slice it, FSU isn't shutting out the ACC competition, but the offense has improved enough from the previous 5-6 years that it's not as important to hold teams to 10 points or under this season. The defensive line is very good, the linebackers are good as unit, but there are no superstars this season, and the secondary leaves a lot to be desired at times. 3. How do you think the coach in waiting thing is working? If Florida State doesn't win the division will the pressure be on Bowden or Fisher? Scalpem.com: I don't think there's much pressure on either one of them this season. To be honest, I think the realistic FSU fans thought that 8 wins was doable at the beginning of the season. Then the ACC decided to turn into a free for all. Fisher is slowly taking over the program. He's intense in the press conferences, and Bobby Bowden basically defers to him on any QB / Offensive game plan questions. Either way Fisher has it good right now, if he doesn't get the head coaching job by the January 2010, FSU owes him a cool $1.5 million dollars. As for the division title, if FSU doesn't win it next year, with a much improved offensive line, two QBs that have only played under Fisher and emerging star Jermaine Thomas at RB, then there will be a lot of questions posed to Jimbo. Bobby will never feel any heat from anyone important, he saved FSU football, the field is named after him and there's a statue of him out front. He gets to make the call on when to quit. Scalpem.com: FSU hasn't had a ton of luck in the blackout games, but I think they'll get it done on Saturday night. The Seminoles improve bit by bit each week, so Saturday night shouldn't be any different. Look for Jermaine Thomas to have another big game with his limited touches and be sure to watch Graham Gano, the best kicker in the nation (17/17, 5 FGs over 50 yards this season). Defensively, see if Budd Thacker can get some pressure on the BC backfield and QB. However, I think this one is closer than a lot of Noles fans think... Noles 31 Eagles 28. CHECKOUT SCALPEM.COM FOR MORE ON FLORIDA STATE FOOTBALL. The men's soccer team takes on Clemson in the ACC tournament Wednesday afternoon. The women's soccer team will host Central Connecticut in the first round of the NCAA tournament. Musburger and Herbstreit will call Saturday night's game against Florida State. The coverage map should be out later today. I think those of you in Big XII markets will have to watch Colorado-OK State. Florida State is doing the Black Out thing again. How did that work last time? Fred McGriff's son has interest in BC. Our defense impresses Jimbo Fisher. 2010 recruit Scott McVey lists BC among his favorite. The Sporting News considers Rice among the best point guards in the nation. Here is Kenpom's preview of the basketball team. Here is an FSU writer's summary of our team. 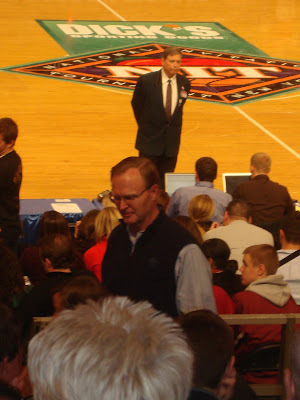 Pat Forde is looking for David Gordon. I guess he didn't see Holly Rowe's interview with him during the Notre Dame game.